Today I found out how flies land on the ceiling. A popular notion of how they accomplished this used to be that the flies would do a half barrel roll sideways just before landing on the ceiling and then let their momentum carry them the rest of the way up. This was shown to be incorrect when, in 1958, Natural History Magazine took and published photos of flies landing on the ceiling. What is actually happening here is that as the fly approaches the ceiling, flying normally, it extends its forelegs above its head and grabs the ceiling with its front feet. It then uses its momentum to swing the rest of its body up until all its legs are firmly attached to the ceiling. At this point, you might be asking how they manage to hold on to the ceiling with gravity pulling them down. Scientists used to think that the little hairs on the fly’s feet allowed them to grip tiny cracks in surfaces they walked on. However, in 2006, researchers at the Max Planck Institute in Germany discovered that the substance secreted by the hairs on a fly’s feet is actually a very sticky glue compound. This glue is strong enough to hold the fly’s weight as it walks upside down or up the wall. In order to get each foot unstuck as the fly walks, it has to push its foot away from itself and peel it off the surface of what it is stuck to. 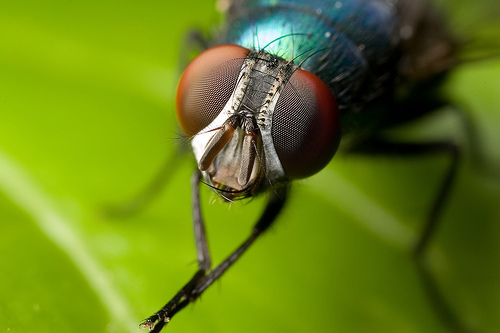 Because this takes a lot of energy, when the fly is on the ground or any surface where it is walking right side up, it will only use three of its legs to walk; so it doesn’t have to expend so much energy unsticking all its feet. 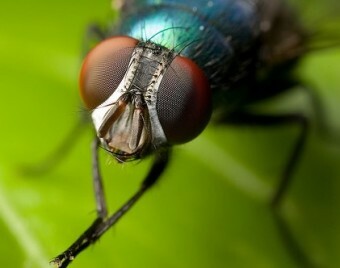 This sticky glue on its feet is also one of the reasons flies tend to spread diseases so well. When they walk on feces, garbage, etc, the glue on their feet picks up all sorts of harmful bacteria and they spread this bacteria by walking on, for instance, you or your food. YUM! How Come Flies Don’t Fall Off the Ceiling? How Do Houseflies Land on the Ceiling? OK great, so now I will be even MORE of a germ-a-phob with flies on my food! Thanks, I think! Gee I hoope my tax dollars went to funding these gripping and extremely important studies. hohokusexpat, what the hell do your tax dollars have to do with this site? …actually, i dont think im going to bother trying to argue with somebody who obviously ignores a sites content and decides instead to post inane one liners like “i hope my tax dollars went to funding these gripping and extremely important studies”. Actually ‘Wow’, I think his comment was quite comedic. He isn’t talking about the site, he is talking about the scientists at the Max Planck Institute spending tax payers money on discovering why flies can walk on the ceiling. Sure, the mac planck institute is in germany but itwas the idea behind his comment, it wasn’t literal. Didn’t need to read article. I enjoyed the article. You should learn.at least one new thing everyday. Shoot I’m not even out of bed and I now know how flies land on ceiling. We actually looked out up because as a child it was an extra credit assignment in one of my husband classes…..no one knew the answer.